Mumbai: Consulting firm Booz Allen Hamilton Inc. has suggested to National Aviation Co. of India Ltd, or Nacil, that runs national flag carrier Air India, at least 70 cost-cutting and revenue-enhancement measures that could generate up to Rs5,000 crore in next 18 months. Air India posted a Rs5,548 crore loss in 2008-09 and is expecting another Rs5,000 crore loss in the current fiscal year. The government, which owns the airline, has clarified that it will link further equity infusion in the ailing carrier to performance. Air India, which had posted an accumulated loss of Rs7,774 crore till now, appointed Booz Allen in October to look at costs across the board and suggest ways to save. The first meeting of the consultant, which has worked extensively with airlines in other parts of the world, with the carrier’s board took place in New Delhi on Monday. “At the meeting, we have identified at least 70 cost-cutting measures in the first phase out of a total 260 proposals. Booz Allen has mooted a three-year cost-cutting plan," said a senior Air India official, who spoke on condition of anonymity as he is not authorized to speak to media. “The targeted savings for Air India through the cost savings and revenue enhancement measures is at least Rs5,000 crore in next 18 months. The whole idea is to improve the operating profit by looking at even smallest of measures," he added. Air India has asked the government for a loan and equity infusion of around Rs15,000 crore after the bleeding carrier’s borrowings increased to Rs15,241 crore at the end of June, up from Rs6,550 crore in November 2007. Its current equity stands at Rs145 crore. Public relation agency 20:20 Media that represents the consulting firm in India said in an email that the firm would not be able to comment on the issue because of issues related to client confidentiality. Jitender Bhargava, executive director (corporate communications) at Nacil confirmed the Booz Allen meeting, but declined to divulge details. “International companies do not like to share the details that they are working on. Broadly there are 70-80 proposals that Air India is currently working on to cut cost across the board," Bhargava added. Without elaborating, Bhargava said the carrier is looking at measures such as pruning of non-core activities, phasing out foreign pilots, trimming fleet network, route rationalisation, recalling officers posted abroad and closure of offices in cities to which the airline doesn’t fly. A second Air India executive, who is familiar with the development but asked not to be identified because he is not authorized to speak to the media, said the airline formed a high-powered steering committee on Monday to monitor the implementation of cost-cutting measures suggested by Booz Allen. 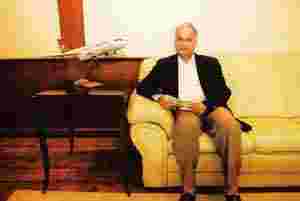 “The committee has been formed under Air India chief Arvind Jadhav. It will monitor the implementation on a weekly basis. We have already identified key executives who will be responsible in implementing these measures," he added. Going by Booz Allen’s three-year cost-cutting plan, the airline will be able to save at least Rs400 crore by March 2010, another Rs1,400 crore by March 2011 and yet another Rs2,300 crore by March 2012, he said. “The three-year cost-cutting plan will help Air India to save about Rs4,100 crore. Together with the revenue-enhancement measures, which will be executed immediately, cost cutting would yield Rs5,000?crore?savings?in next 18 months," said this executive. The first Air India executive quoted said the cost-saving programmes are broadly divided on the basis of optimum fleet utilization, network rationalization, IT initiatives, financial restructuring, human resources initiatives, and cargo and charter revenue-enhancement measures. “The steering committee will have sufficient power to ensure a time-bound implementation of cost-cutting programmes," he said. Analysts and industry observers are not convinced about the efficacy of the measures. “I have not studied the Booz Allen plan, but I would say there is a limit to cost cutting. There will be reaction to this cost-cutting drive from a public sector undertaking," said Sanat Kaul, India chapter chairman of International Foundation for Aviation and Development. According to him, the basic issue is not cost cutting, but losing market share. Kaul said the public perception is that Air India is no more a reliable airline. “You need to recapture the market share first and foremost." The airline’s domestic market share which was 16.6% in August rose to 17.5% in September and further to 18.6% in October. Meanwhile, in a statement issued on Tuesday, Air India said a group of ministers has assured financial support to the carrier in the form of equity infusion and that the first instalment of Rs400 crore is expected by January 2010. “Further instalments would be tied to the milestones of savings effected on account of cost cutting exercise adopted by the national carrier at various levels. Nacil is simultaneously taking effective measures to enhance revenue to the extent feasible in today’s market environment," the statement said. The statement also said that Air India, like other airlines worldwide, is expected to continue witnessing a strained cash flow due to a weak economic and revenue environment. “The yields continue to be low due to the excess capacity both in the domestic and international markets and consequent low pricing by all carriers." The carrier also said it is trying to address issues concerning the delayed payments of productivity linked payments (PLI) to employees. The cash-strapped airline had suggested a 50% cut in these payments to save save about Rs700 crore. Productivity linked payments currently account for 30% to 50% of the wages of employees at the airline. Air India has not paid this since August. Its employees, including pilots, have opposed this move and threatened to halt work. “Efforts are being made to settle the PLI payment payable in October 2009 shortly, so that the PLI arrears are cleared till date and that future PLI payments are not in arrears for more than a month," Air India said.